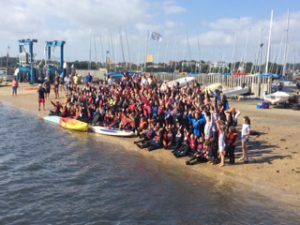 Abersoch Dinghy Week – For the results go to http://www.scyc.co.uk/Racing-Results/index.php and then click on ‘VERY LATEST RESULTS CLICK HERE!’ (in red) at the top of the page. Well done to Nick and Lucy Heginbotham for winning the Fast Mixed Dinghies. Scorpion National Championship – http://www.yachtsandyachting.com/news/191417/Gul-Scorpion-Nationals-at-Looe-overall Dovestone’s Andy McKee with Chris Massey as crew ‘enjoyed’ a week of close racing finishing up third overall and just one point behind the winning boat. That’s what you call a ‘hard week’s sailing’. Parkstone Youth Week – Evan and Zoe Parry took part in Parkstone Youth week with over 300 youths. Evan winning the 4.7 Laser fleet. Merlin Rocket National Championships – http://www.yachtsandyachting.com/news/191757/Selden-Merlin-Rocket-Nationals-overall – too many OCS’s for Hollingworth’s Richard Whitworth crewed by Pippa Taylor and Stu Bithell crewed by Tom Pygall to come in the chocolates!